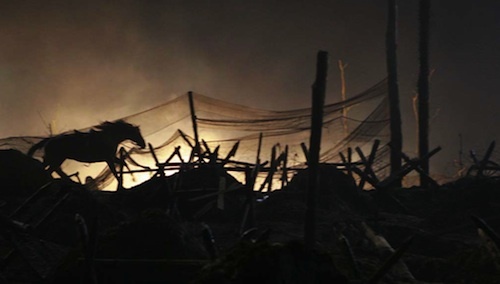 War Horse is a heartfelt, affecting film about the devastating power of war that is almost undone by the incredibly silly conceit at its heart. Based on Michael Morpurgo's children's book and the absurdly popular stage play that it inspired, Steven Spielberg's film tells the story of World War I not through the eyes of the soldiers fighting it, but by following the journey of a horse named Joey, who is raised by a young man named Albie (Jeremy Irvine) in Devon, then sold to the Army by Albie's father (Peter Mullan) to pay the rent on their farm. Once he is on the continent, Joey is passed from owner to owner, and through him Spielberg depicts the various ways in which war affects all those who are touched by it. The idea of using an animal as a means of examining the different sides of a story is not a bad one - Robert Bresson used more or less the same idea in Au Hazard Balthazar - and the episodic structure of the film lends itself naturally to exploring the various facets of war since it provides connecting tissue by which the disparate events and characters can be joined together. The problem comes from the opening segment, which is dedicated to Albie's time training Joey before the war and spends much too long establishing their relationship, to the detriment of the film since it only serves to delay the far superior movie that lays beyond the first act. That a young man would become emotionally attached to an animal is hardly preposterous, as anyone who has ever had a pet will be able to attest, but Spielberg and his writers, Richard Curtis and Lee Hall, hammer the point over and over, leaving no room for any doubt that Albie really cares about Joey, who is a remarkable horse, a fact we know because everyone says it at every possible opportunity. This repetition, coupled with the sluggish pace compared to everything that comes after, causes the film to falter right out of the gate. Even David Thewlis as a landlord so devious he seems to be actively trying not to twirl his luxurious moustache throughout can't inject much life into these sequences, which also try to invest way too much importance into ploughing a field when the audience knows that World War I is just around the corner. Once the focus shifts from the Horse to the War part of its title, Spielberg's film becomes a far more compelling and muscular beast indeed. The vignettes that follow Joey's purchase by the Army are fleet by comparison, displaying a breadth and scope that the necessarily limited opening scenes could only hint at. Of the episodes, easily the most compelling features Tom Hiddleston as a young officer who rides Joey into battle. The sequence, which also boasts a fine performance from Benedict Cumberbatch as Hiddleston's superior, captures the arrogance of those who are willing to sacrifice the lives of men and beasts on a whim, as well as the heartrending tragedy of so many young men dying for no good reason. Nowhere is this more beautifully conveyed than in a series of shots which show the British cavalry charging into a nest of German machine guns, the guns opening fire, then a stream of riderless horses leaping over the weapon emplacements. It's a moving sequence that is shot through with quiet humanism that is vintage Spielberg. The other episodes are less visceral, but they are no less relenting and each offer their own insights into the many ways in which war divides people and unites people. After being taken by the Germans to be used as a work horse, Joey is used by two brothers as a means of deserting, and in their scared young faces Spielberg captures not only the fear of young men in 1914, but that of every young man who has ever been sent to die for his country. Despite its terrifically realised period trappings - the trenches are suitably grey grim, providing a strong contrast to the warm, earthy colours of the opening scenes - War Horse is less about the First World War than it is about all wars, and it's not difficult to draw parallels between its various episodes and contemporary conflicts, with the most obvious being one about a grandfather and grand-daughter living under occupation in France. Their story could easily be transposed to Iraq or Afghanistan in the last decade with only cosmetic changes. Many might be misled into thinking that War Horse is an uplifting film about the relationship between a boy and his horse. Whilst this does form part of the story, not to mention the weakest part of it, the tone throughout is far bleaker, and despite some moments of levity the film is committed to depicting war in a realistic and harrowing fashion. The scenes in which horses buckle and die as a result of over-work are particularly hard to handle, and the use of the animals throughout do an effective job of conveying the horrific toll of war in a manner which is not graphic. Whilst that might seem like a terrible compromising coming from the man who gave us the Omaha Beach opening of Saving Private Ryan, I think that it has been done in this manner so that children could conceivably see the film and learn about the horror and tragedy of war through the experiences of Joey. At its heart, War Horse is a fairytale, albeit a hard-edged one, which plays to both the best and worst of Spielberg's instincts. In its strongest moments, it has a quiet power to it that I couldn't help but find moving, particularly in the more gruelling moments in which Joey is forced to pull artillery, or during a late-film burst for freedom that winds up being one of the most breathless and exhilarating scenes Spielberg has ever directed. Whenever it turns towards the Albie/Joey relationship, both in the early scenes and towards the end, when the threads of the film come together somewhat awkwardly, whenever John William's lush score is over-used and whenever the characters in the film over explain every plot point, it becomes almost too sweet and sappy to swallow. However, it is an unabashedly earnest and heartfelt, not to mention odd, film designed to pull heartstrings, and I'd be lying if I said that it didn't pull mine.